This entry was posted on Sunday, September 5th, 2010 at 12:00 am	and is filed under Comic. You can follow any responses to this entry through the RSS 2.0 feed. You can leave a response, or trackback from your own site. Page 19, panel 3: According to the visible red windsock, Tom is taking off downwind. Aircraft always take off into the wind where possible. Oh good lord, it is going to be him vs. the Red Baron! Shouldn't that be 1916 not 1918 in the first frame? Nope....he went with 1918 for accuracy, so that Kelso could get the red triplane. The following frames explain that he chose 1918 for accuracy, because if he had picked 1916 Kelso couldn't have flow the red triplane, as it wasn't in use until 1917-1918. It's the Somme Offensive that I was thinking of then (according to the following comments) that made me think it should be 1916 not 1918 as I always assumed that was the 1st battle of the Somme. IMO calling a battle that happened 2 years later then the battle of the Somme everyone has heard of the 1st battle of the Somme is bloody stupid, but that's not really your fault. The Somme Offensive began on 1st July 1916. Richthofen started flying all-red aircraft when he took over command of Jasta 11 in January 1917, flying Albatros D.III and D.V biplanes, in which he gained his notoriety as "The Red Baron". He first flew a Triplane in September 1917. The SPAD XIII went into service in April 1917. The rudder marking should be vertical stripes, blue/white/red, blue closest to the hinge. It has a Hispano-Suiza V8 engine which does not throw castor oil around. From the aircraft involved I assume this is meant to be 1918. The 1918 battles fought around the Somme were part of the Kaiserschlacht, none are ever describe as "the Battle of the Somme". Directly after the war, Operation Michael, from 21 March to 5 April 1918, was designated as the first battle of the Somme. The 1916 "Battle of the Somme" are actually several distinct battles which are popular known as the Somme offensive. However, to my knowledge, this is not its military name. The fourth of april 1918 describes the Battle of the Avre which was part of the response to operation Michael. This was the last active day of the first battle of the Somme. The Germans where unable to repond at the fifth of April. In regards to the rudder marking, you are correct I have no clue on the castor oil comment. Next you'll be telling us nobody called Kelso ever flew a red triplane. If I wanted historical accuracy I would go to the history channel, but I don't. I wanted a fun and enjoyable experience which this is. Even if 'Zorro' goes down in flames I had a good time. Which is, if you think about it, is what any entertainment should give. Also, he's taking off downwind. Why would he do that? Specifically, the Spad XIII first flew on April 4, 1917 and went into active service the next month as deliveries reached the front line. But never let insignificant details get in the way of a good story! 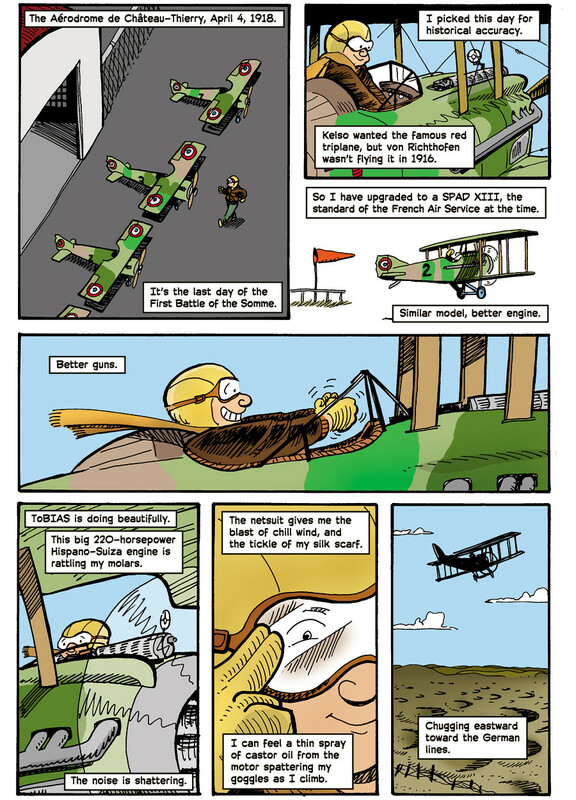 I think he was referring to the Spad XIII's superiority over the Spad VII from page 10 (He mentions "upgrading to the Spad XIII" in the third panel.). In which case he would be accurate... similar airframe, bigger engine, and a second gun. I think the "better engine, better guns" is referring to the Spad VII, not the Dr. 1. S VII and S XIII were "similar planes", while the S XIII and the Dr1 are not. Wow! Just reading that gives me a tight feeling in the pit of my stomach. As soon as Intel makes the GoogolCore cpu chip available i'm going download a bootleg of Tobias. I'm very much enjoying both the strip and the commentary. The details in the dialogue are great, the illustraitions are terrific, and I have found the comments from experts to be light-hearted and informative, by folks who have an eye and memory for details. More! More! Ironically, the Wikipedia article noted that the Hispano-Suiza engine--a non-French product--had to pass a a 50-hr bench test at full throttle before HS got the contract to supply them. None of its French competitors at that point (early in the war) were able. The notorious weakness was in the reduction gears between the engine & propeller. Loving the story & art, even while enjoying the comments & nitpicks. A good story about the SPAD VIIs & XIIIs is "Falcons of France," by Nordhoff & Hall--a childhood favorite of mine. The engine almost certainly did use castor oil, which was the preferred engine lubricant in the days before synthetic alternatives were available. I think what the commenter was remarking on was whether the V8 engine would be spraying castor oil around so that it misted the pilot's goggles. That was a characteristic of air-cooled rotary engines, which were radial engines that spun with the prop, which was fixed to the engine. The crankshaft of a rotary was fixed to the airframe; the engine, instead of turning the crankshaft, would push against it to spin itself and the prop. It was this spinning of the engine that made the air cooling effective; designers hadn't yet figured out how to build a reliable stationary air-cooled aircraft engine. Engines which were lubricated with castor oil would discard this oil after it had passed through the engine, because castor oil would start to cook after exposure to engine heat, so it could not be recirculated. With a rotary engine, this waste oil would be sprayed in all directions. The round engine cowlings you see on some World War I aircraft are a tell-tale sign of a rotary, and the cowling was there to stop the oil spraying around. But a little oil still got past the cowling. Because the V8 engine in the SPAD was a stationary water-cooled engine, it would not be spraying oil in the way an air-cooled rotary would, so there would be less likelihood of a castor-oil mist affecting the pilot. No update yesterday or today. How long are we going to be left hanging on the edge of this cliff? Whups, i was reloading a day-specific URL, you can ignore (not post) my comments.